CHICAGO (Reuters) - Television actor Jussie Smollett, arrested last month on a single charge of perpetrating a hate-crime hoax, has been newly indicted on 16 felony counts of falsely reporting to police that he was assaulted by two strangers shouting racist and homophobic slurs. The indictment, returned by a Cook County grand jury on Thursday and made public on Friday, greatly expands on the legal jeopardy faced by Smollett, whose story of being attacked in Chicago by supporters of U.S. President Donald Trump has drawn suspicion since it first surfaced in late January. Smollett, 36, who is black and openly gay and plays a gay musician on the Fox network hip-hop drama "Empire," was charged last month in a single-count criminal complaint with making a false report to police, defined under Illinois law as a form of disorderly conduct. Each count carries a maximum penalty of three years in prison and a $25,000 fine. Smollett's attorney, Mark Geragos, blasted the indictment in a statement as "redundant and vindictive," adding that his client "adamantly maintains his innocence even if law enforcement has robbed him of that presumption." He also said that leveling charges in an indictment spares prosecutors the need to submit evidence and witnesses to defense cross-examination in a preliminary hearing, where a judge decides if sufficient cause exists for the case to proceed to trial. At the time he was initially charged two weeks ago, Chicago Police Superintendent Eddie Johnson said Smollett had paid two brothers $35,000 to stage an assault on him in a hoax orchestrated to somehow further his acting career. 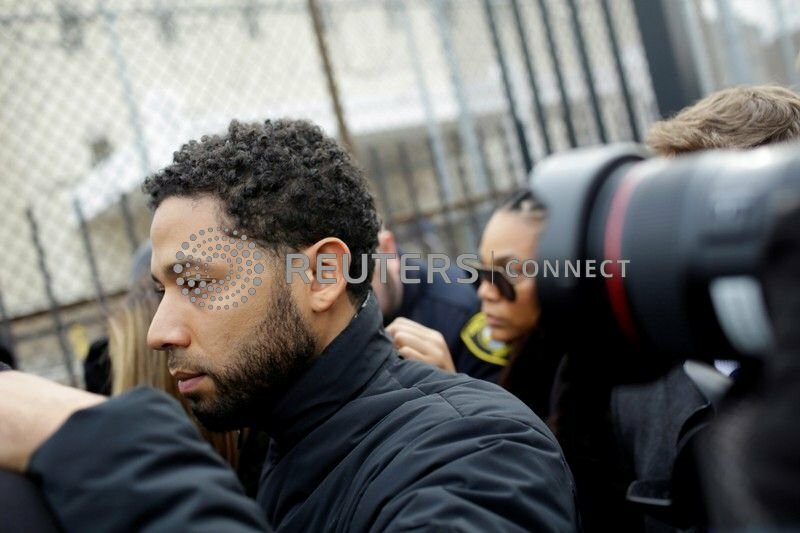 Smollett has remained free on $100,000 bond since his release hours after surrendering to authorities on Feb. 21. He already was scheduled to return to court on March 14. In the meantime, there is no warrant for his arrest in connection with this week's indictment "because it's the same case," Chicago police spokesman Anthony Guglielmi told Reuters. No mention is made in the indictment of Smollett's claim, according to police, that his attackers yelled, "This is MAGA country," referring to Trump's "Make America Great Again" slogan, as they accosted him. But the 16-page document includes other elements of the account that Smollett had stood by for weeks. According to previous police recitations of Smollett's story, he reported that two masked men approached him on the street in the early hours of Jan. 29 shouting racial and homophobic slurs, struck him in the face, doused him with an "unknown chemical substance" and wrapped a rope around his neck before they fled. In an interview with ABC's "Good Morning America" days before he was charged, Smollett said he was angry that some people questioned his story, and he suggested the disbelief might come from racial bias. His attorneys said after his arrest on Feb. 21 they were conducting a thorough investigation for purposes of mounting the actor's defense. Smollett himself, according to reports in media citing unnamed sources, apologized last month to the cast and crew on the set of "Empire" but maintained his innocence. The release of the indictment came after the Chicago Police Department said it started an internal investigation into how information about the alleged hate crime against Smollett was anonymously leaked to reporters. Geragos said the indictment was designed, in part, "to distract from the internal investigation." "Empire" debuted on Fox in 2015 and has earned multiple Emmy nominations. Smollett plays the character Jamal Lyon, a member of the family that is the focus of the drama. Producers said in February they were removing his character from the final two episodes of the show's current season. He's well and truly screwed. Or will be if he receives a custodial sentence. What a moron. Unbelievably stupid stunt. On the show...his mom, dad and brother all did hard time. Looks like his TV family really had an influence. Idiot. At first read, I thought you used another rhyming noun that would have snuggled in nicely with your description of this creature. This is a case that I hope he gets maximum charges to discourage anyone else from trying this nonsense. Given his background, don't bet on it. This will be interesting. Black guys usually get harsher sentences...even the affluent ones. Remember Wesley Snipes got 3 years for 3 misdemeanor charges, while Paul Manafort only got >4 years for 8 felony charges! Hardly seems equitable. Jussie's definitely gonna pay some fines and prob do some time. The interesting part will be how long his sentence will be. Black guys usually get harsher sentences...even the affluent ones. Remember Wesley Snipes got 3 years for 3 misdemeanor charges, while Paul Manafort only got >4 years for 8 felony charges! Hardly seems equitable. That is the least convincing argument for disparity in the justice system I have seen. A 2014 University of Michigan Law School study, for instance, found that all other factors being equal, black offenders were 75 percent more likely to face a charge carrying a mandatory minimum sentence than a white offender who committed the same crime. LOL did you read the study as opposed to the agenda driven analysis? if you did, you would not have posted it.